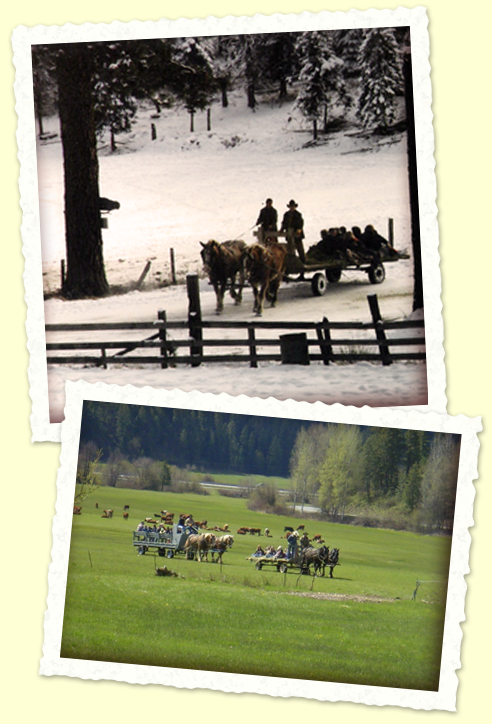 Let our big draft horses and wagon overflowing with soft, sweet smelling hay be your transportation back into another time. Your journey will take you for a quiet tour of our meadow where our spectacular longhorn cattle share their domain with an assortment of wild animals and birds. Relish the smells of summer, the crispness of fall, the sparkle of winter or the lush green of spring on this 30 to 45 minute ride. However, the fun is not over yet! Back at our barn area, your outing can be concluded with simple refreshments or a full meal. When the air is crisp there is always an enticing campfire, hot chocolate, hot apple cider and a supply of marshmallows to roast on fresh willow sticks. For cool weather hayrides we have a supply of lap robes for you to use. Yours are welcome too if you don't mind them collecting a little hay. We do have a $60 minimum.